Researchers at University of California, Riverside have been studying the Kangaroo Rat, which they have lovingly dubbed the "Ninja Rat" for the past seven years. The little rodent has such quick reflexes and acrobatic abilities that it can often evade rattlesnake strikes, which can happen in a blink of an eye. It's the classic predator-prey matchup. A stealthy rattlesnake, patiently waiting for the right moment to strike a seemingly unsuspecting and vulnerable kangaroo rat. But high-speed video from researchers in Southern California reveals the little desert rodent's surprising arsenal of defensive moves, sharp reflexes and a stunning combination of strength and agility. 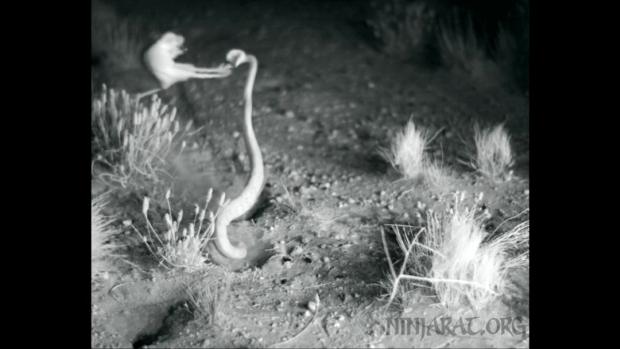 Unable to jump clear of the snake's ambush strike, the kangaroo rat unleashes Plan B -- a twisting leg kick that knocks the snake to the ground, leaving it with a mouthful of dust and dirt instead of dinner. "These lightning-fast and powerful maneuvers, especially when executed in nature, tell us about the effective strategies for escaping high-performing predators," said Timothy Higham, associate professor in the Department of Evolution, Ecology and Organismal Biology at UC Riverside. "Those that are successful at evading the strike will suggest ways in which the kangaroo rat might be evolving in response to the intricacies of the predatory movements." 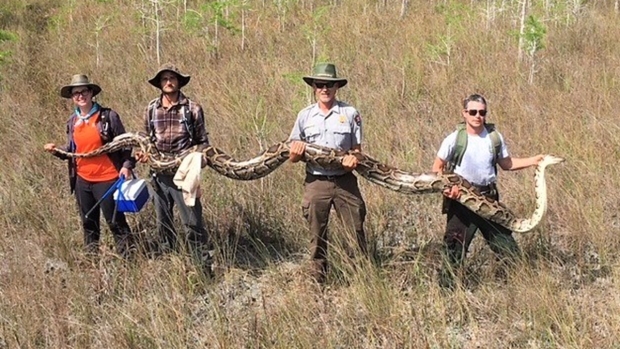 The research team, which includes students from UC Riverside, San Diego State University and UC Davis, tracked snakes' hunting behavior, then placed the high-speed cameras in locations where they interacted with kangaroo rats. The video they produced is believed to be the first detailed look at how kangaroo rats defend themselves against such a fearsome and secretive predator, according to researchers. Video captured by Southern California researchers shows the moment a rattlesnake strikes at a seemingly defenseless kangaroo rat. It turns out, the little rodent had a final surprising line of defense. Consider that a human eye can blink in about 150 milliseconds. That's not as fast as a rattlesnake can strike its prey, but not always fast enough if the target is a kangaroo rat. "Kangaroo rats that responded quickly were frequently able to jump clear of the snake completely, leaving the serpent biting nothing but dust as the kangaroo rat rocketed seven to eight body lengths into the air," said Rulon Clark, an associate professor of biology at San Diego State University. "But in perhaps the most surprising finding of our research, kangaroo rats that did not react quickly enough to avoid the strike had another trick up their sleeves: They often were able to avoid being envenomated by reorienting themselves in mid-air and using their massive haunches and feet to kick the snakes away, ninja-style." The spin-kick captured on camera unravels a years-long mystery. Previous videos used lower-speed cameras, which didn't pick up the defensive trickery. In those videos, it appeared that the snakes actually bit their prey, but blood tests on the kangaroo rats showed no signs of venom. "In this new work, we used cameras with much higher recording speed and resolution, which helped show in exquisite detail that kangaroo rats not only have record-breaking reaction time, but can also use their long tails to reorient their bodies while jumping, thereby optimally positioning themselves for both defensive kicking and landing on their feet," said Malachi Whitford, a doctoral student at San Diego State University. Hair-trigger reflexes and superior athleticism are only part of the equation. Researchers also noted that kangaroo rats have senstive hearing, which means they can pick up the low frequency sounds to foil ambushes. Their large hindlimb muscles and robust tendons allow them to jump so well. Check out more videos from the research team here.